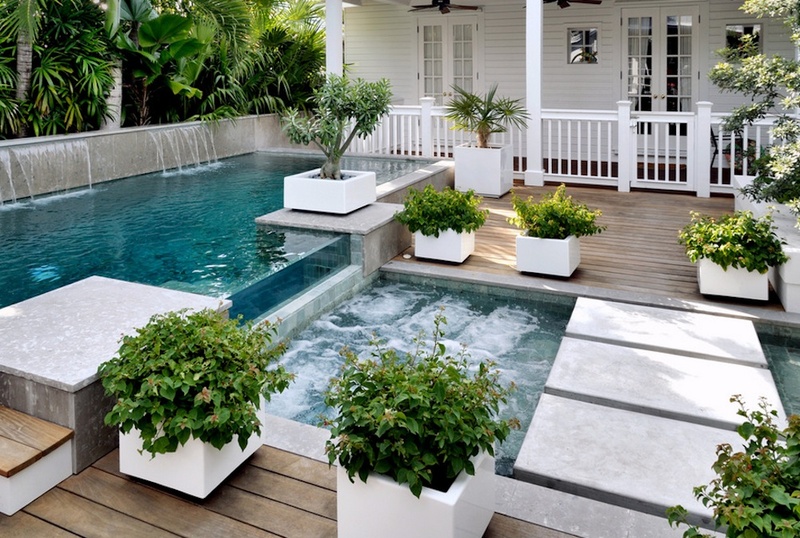 The idea of having a pool in your own backyard will always be incredibly glamourous. It’s easy to give into daydreams of hosting weekend parties, adopting an invigorated fitness routine that includes laps after work, and spending long afternoons lounging poolside while cultivating the perfect tan. But, in those daydreams, one crucial element of pool ownership is often forgotten: the maintenance. Without a proper maintenance routine, your pool could succumb to a variety of less-than-luxurious conditions – green water, broken filters, and algae build up, just to name a few. And, no one wants to lay by a pool that’s seen better days. 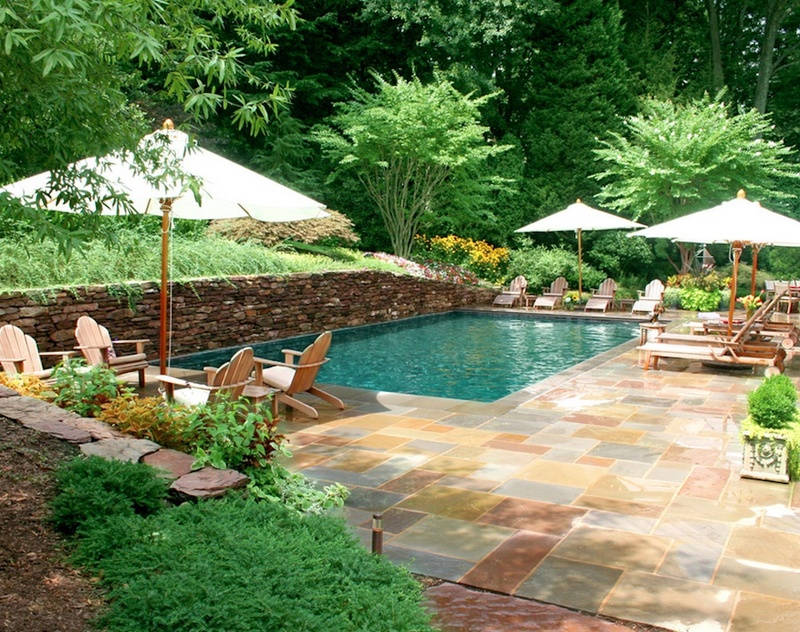 Here are 10 pool maintenance tips that you need to try right now. 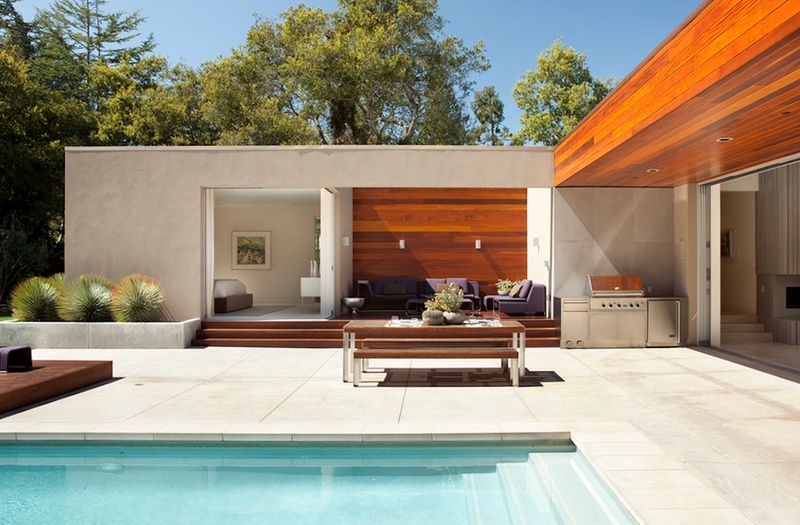 Whether you’ve just opened your pool for the very first time or you’ve been a proud owner for years, check out these tips to get your summer season off to the right start. Skimming the leaves and debris off of the surface of the water is a no-brainer, but it bears repeating. For a truly pristine pool, skimming should be done daily. In addition to skimming, you need to scrub the sides of the pool to prevent algae build-up. Thankfully, that doesn’t need to be done quite as often. You can get away with scrubbing once every other week. Just look for any growths and go at them with a scrub brush to keep your siding looking fresh and clean. For those particularly stubborn spots that won’t go away with any amount of elbow grease? Repurpose an old sock. Fill it with chlorine and let it sit on top of the spot for a few hours before scrubbing once more. The chlorine will eat away at the algae and you’ll finally have a use for those socks without pairs. It’s a win-win. 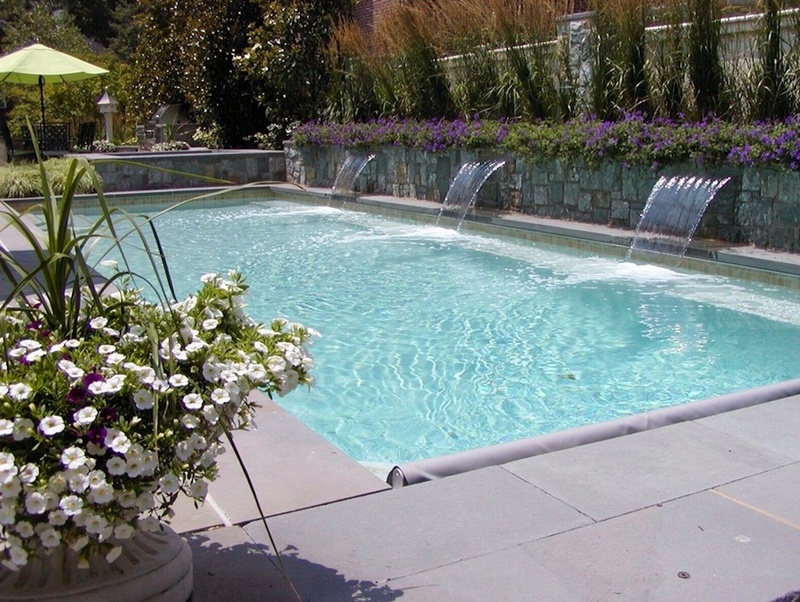 Chemical levels are arguably one of the most important facets of pool maintenance. Improperly balanced water looks murky, irritates skin and eyes, and can cause your pool to become a breeding ground for bacteria. Cyanuric Acid – Protects chlorine from sunlight and determines the required Free Chlorine level. An ideal reading for outdoor pools is 30- 50. Free Chlorine – A sanitizer which keeps your pool water safe and free of germs. Acidity/Alkalinity – Also known as the PH level, acidity needs to be kept between 7.5 and 7.8 to prevent irritation and protect the pool equipment from eroding. Total Alkalinity – Helps keep the PH in balance. Levels should be within range of 60-120. Calcium Hardness – Appropriate levels help prevent plaster damage. Aim for 220-350, but lower for pools with vinyl siding. Testing the water is easy. Simply buy a few testing kits from your local pool store. Fill it with a sample of your pool’s water. Add the provided solution to the testing kit and close the vials. After a few seconds, your sample water will change color and a comparison of the sample water to the colors shown on the testing kit should allow you to determine the current chemical levels. You should adjust the levels, as needed, to achieve an ideal balance. When all the chemicals are properly balanced, the water should be crystal clear, have no scent, and leave very little residue on your skin. There’s no denying that pool chemicals can be expensive to purchase, so why not get a little help straight from the grocery store? Most pool stores suggest using sodium bicarbonate to control the alkalinity of a pool without drastically reducing the PH levels. They will try to sell overpriced solutions in order to get the job done. As it turns out, regular baking soda does the same job as sodium bicarbonate for only a fraction of the price. All baking soda boxes even have “sodium bicarbonate” listed on their ingredients label. Take a look! If you’re worried that using baking soda will mean doing a lot of complicated mathematical conversions, don’t be. Baking soda has the same concentration of sodium bicarbonate per pound as the solutions, so the amount you’d need to add to your water would be identical. On the topic of chemicals, don’t be afraid to shock your pool when necessary. While that may seem like a process only fit for public pools. But, think about how your pool water looks after you throw a big party. Odds are it’s murkier than it was the day before the big bash. That murkiness? It’s bacteria that you’ll want to get rid of as soon as possible. Shocking refers to drastically raising the chlorine levels for a short period of time to kill bacteria. It’s done by diluting three to five times the normal amount of chlorine or other chemical sanitizer with water, slowly poring it into the pool’s return line, letting it filter throughout the pool, and then slowly refilling the pool with water over time. While shocking too often would risk damage to your pool’s siding, you should aim to shock the pool at least twice every season. As important as the chemical composition of the water is, the physical water level is just as important. The levels will naturally fluctuate after a heavy rainstorm or an afternoon of kids doing cannonballs. You want to maintain a level that is halfway up the opening of your skimmer. If the water is too low, simply use a garden hose to add the necessary amount of water back in. If the water level is too high, rent a submergible pump from a home improvement store to drain the excess. However, if you’re pool’s liner is a vinyl or fiberglass material that could be easily damaged by the weight of the pump, consider consulting a professional. When you’ve reached the appropriate water level, remember to recheck the chemicals. The water level fluctuations will have thrown them off balance. Most of the time when people think about tennis balls in a pool, they think about playing catch. However, those toys can do double duty. When swimmers exit the pool, certain oils can get left behind in the water – suntan lotion, hair product, the natural oils produced by our skin. While it’s unpleasant to think about, luckily there’s an easy solution. Simply throw a tennis ball into the water. The fibers used to make the tennis ball will help absorb the oils and keep them from leaving a slick sheen on top of the water. 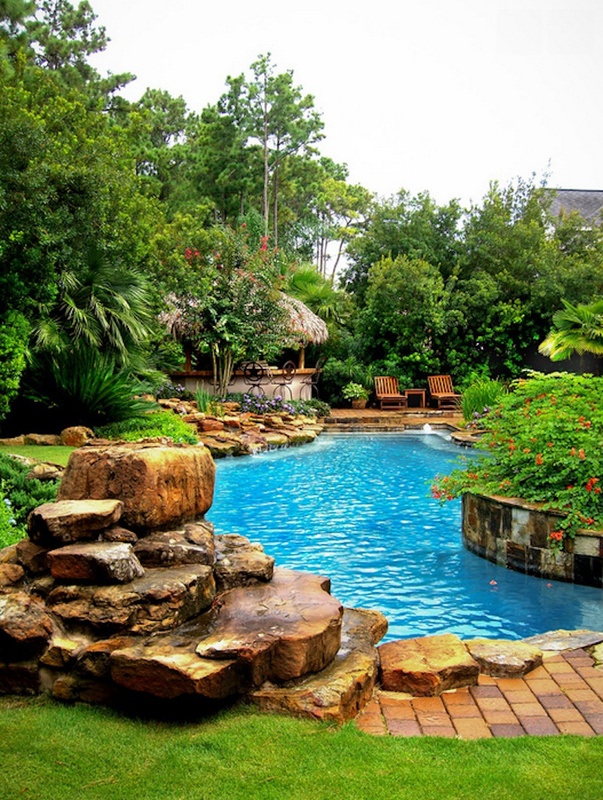 The area that surrounds your pool is just as important as the physical structure itself. You can help keep your pool deck shining by power washing. Power washing, also known as pressure washing, will help get rid of any rust or weather stains that occur over time. You can rent a power washer at any home improvement store. Start the process by sweeping the deck free of any errant dirt or leaves first, so you don’t end up spreading them all over during the cleaning process. Then, put the power washer together according to the directions. Set the machine on a weak to medium power spray and remove the surface debris in layers, repeating the process until the surface is clean. As you spray, be sure to overlap the areas you’ve cleaned in order to help prevent streaks. You’ll want the nozzle of the power washer several feet off the surface of the pool deck and maintain this height to prevent gouging. Sometimes you need to trust an expert. Especially when it comes to your pool’s mechanical equipment – pumps, filters, heating systems – you may not have the proper knowledge for care. At least once a year, have a pool service professional come out to check your devices. Before your appointment, take a thorough look at your pool as a whole, making sure to use all of your senses. Compile a list of any leaks you see in the piping, holes you notice in the linear, loud sounds coming from the mechanisms, or odd smells coming from the water. Mention them to your serviceperson in oder to give him or her an idea of where to start. In the event that there is noting amiss with your pool, the yearly service appointment may seem like a waste of money and it can be tempting to cancel. But remember: Detecting and fixing a small problem now can save you from having to fix a huge crisis later down the road. Before closing up shop in the fall, buy a water testing kit to ensure your chemicals are correctly balanced. Then, blow any excess water out of your plumbing lines, and invest in a cover to keep the pool free of debris. Keeping a pool in good shape does entail a certain amount of work, but it doesn’t need to be a burden. By incorporating these pool maintenance tips into a regular cleaning routine, you can ensure that you’ll spend more time sunbathing than doing chores. Which is exactly how it should be. Do you have a great pool maintenance tip to share? Let us know in the comments below.